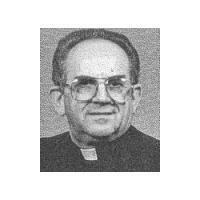 Our revered, respected and loved Father Joseph Szklarski died last Saturday morning. One year ago on June 24, during the Mass for his fiftieth year as a priest, I said that if you wanted to know what the definition of a priest is, look at Fr. Joseph. He lived the life to which God called him. He was never too tired or too busy to hear confessions, to visit and to anoint the sick in hospitals and in their homes or to pray for and to bless all those who made a request. All the parishioners knew him as a cheerful, kind priest and as one who was genuinely concerned about them. That's the definition of a priest. God calls certain men to do this special work of salvation through praying, through teaching the faith and though administering the sacraments. Yes, it is true that all baptized Catholics share in the priesthood of Jesus Christ. Those, who are ordained to the priesthood through Holy Orders, receive the power to absolve sins, to offer holy Mass and to give us other sacraments. This makes the fundamental difference between the priesthood of the ordained and that of the laity. Counseling and social works are secondary to the priests work of praying, teaching and sanctifying. Christ on the Cross redeemed the world. He continues to save souls through his people and his ordained priests. A priest has this obligation twenty-four hours a day, seven days a week. He is a priest wherever he goes even on vacation and even while sleeping. At ordination he receives an indelible character on his soul that identifies him as being in Holy Orders. This character remains for all eternity as does the indelible characters of the sacraments of Baptism and Confirmation. He is a priest forever even in those rare cases where the priest for some reason is laicized. Fr. Joseph was the best example of a priest. He was a 24/7 active priest. Every day he was in the Confessional. About a week before his death, while visiting him in the hospital, although he was barely conscious, I said to him: "Fr. Joseph, get well soon. We need you back home to hear confessions." Then, almost immediately the thought came to me that he would be doing more priestly work in heaven, praying for more people that they make better and more frequent confessions. He would be like St. Therese who said: "I will spend my Heaven doing good on earth." I think that Father received a reward for his faithfulness. He had a beautiful death. Most of the time in the hospital, he was surrounded by parishioners, family and friends who prayed and sang hymns. His patron, St. Joseph, by the way is the patron of a happy death. Perhaps he brought Father to the arms of his spouse, Our Lady, who in turn brought him to her Son. Yes, Fr. Joseph was a real priest, a good priest, a priest forever.